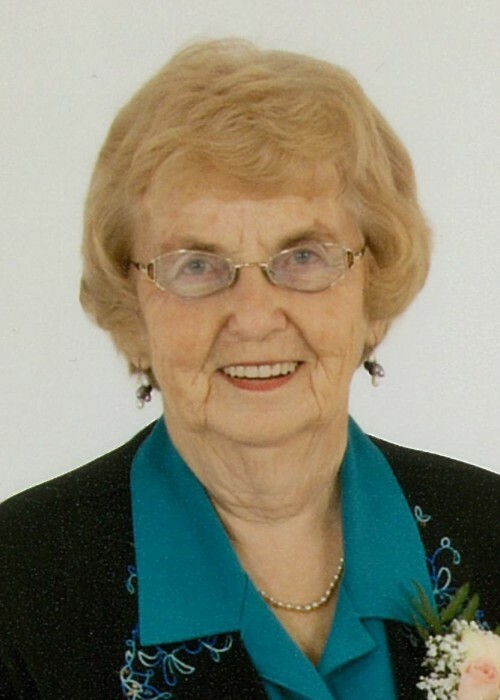 Vera (Alvira) Doerksen left us peacefully on February 2, 2019. Vera was born in Main Centre, Saskatchewan. She married Jack (Johan) Doerksen on July 10, 1952 in the Capeland Church. She made many dear lifelong friends and enjoyed travelling throughout Europe during their 'Air Force years'. Vera was a hairdresser for over four decades and an active contributor to the community. Friends and family will remember Vera for her sense of humour and love of the outdoors, gardening and camping well into her seventies. Vera is survived by her loving children and their spouses Norma and Randy (Regina), Holly and Lynn (Ottawa), Kelly and Cynthia (Victoria), and Wendy (Winnipeg). Vera cherished the time she spent with her four grandchildren, Brad, Kaelan, Ryan, and Emma. Vera's time with nieces and nephews Dale and Marsha and Raegan and Lane and their children was also very dear to her. Also surviving Vera are sisters Evelyn and Julie and brothers Gerald and Raymond. Vera was predeceased by her husband Jack, son Brad, and sister Lorraine. The family profoundly appreciate the dedicated staff of Prairie Wind Estate (Herbert) and the Shaunavon Hospital and Care Centre for their professionalism and outstanding care and compassion. Flowers are gratefully declined. For those wishing, Vera’s preferred charities were Hope For Wildlife (www.hopeforwildlife.net) and the Canadian Cancer Society. No funeral by request. Friends and family will gather to share stories and memories on a date to be chosen in summer.